Above: A publicity portrait of Richard Alexander from Zorro Rides Again (Republic, 1937). Gigantic and grim-faced, Richard Alexander was admirably suited to henchman roles. His hulking presence in the villains’ ranks automatically made the forces of evil seem more intimidating; however, he also leant his intimidating presence to the good guys’ side on a few memorable occasions. Oddly enough, Alexander’s serial and B-movie career was a very limited one. After playing two major heavies and one prominent good guy in a quartet of 1930s serials, he would spend virtually the entire remainder of his career as a bit player in serials and features alike. However, the high quality of those four 1930s serials–and the strength of Alexander’s performances in them–has secured the big guy a firm place in cliffhanger history. Richard Alexander was born in Dallas, Texas. Little information seems to be available on his early life, before his arrival in Hollywood in the mid-1920s. After starting as an extra, he began to appear before the camera on a regular basis in 1927, playing some bit parts but also taking major roles in some bigger-budgeted silent movies like The Leopard Lady and The Viking. The coming of sound exposed his Texas accent and relegated him largely to Westerns; the early thirties found him playing large roles in Columbia B-westerns (Tim McCoy’s Two-Fisted Law, Buck Jones’ The Fighting Code) while also playing bits—as bouncers, thugs, and the like—in non-Western features. Alexander’s first serial was The Law of the Wild, a 1934 Mascot cliffhanger set in the contemporary West. 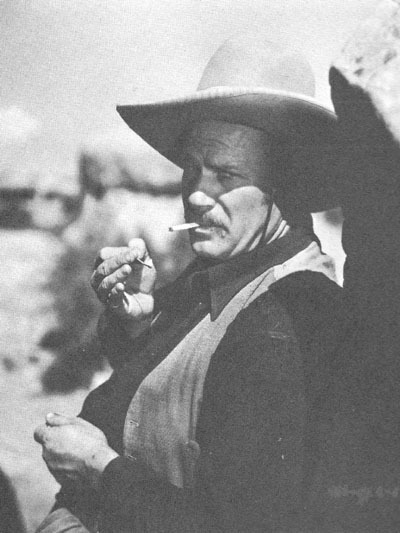 He appeared in the first chapter as a nasty wrangler named Lou Salters, who set the serial’s plot in motion by stealing the prize wild stallion Rex from his employer, hero Bob Custer. Salters tried to cash in on the horse by running it at the racetrack, but he was soon murdered by a disgruntled cohort (the crime was subsequently blamed on Custer). Alexander was memorably nasty in his small but pivotal part–bullying Rex and canine co-hero Rin Tin Tin Jr., coldly and violently trying to murder Custer, plausibly lying to local ranchers to cover up his misdeeds, and confidently swaggering around the racetrack just before his murder. Above: Richard Alexander is confronted by Rin Tin Tin Jr. in Law of the Wild (Mascot, 1934). As the thirties progressed, Alexander’s larger B-western roles became scarcer and his uncredited bits more numerous. 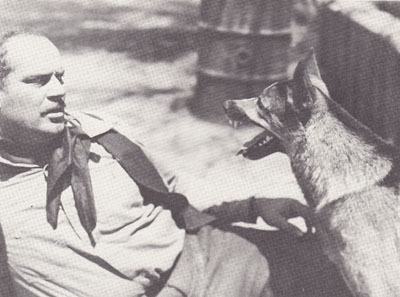 In 1935 he appeared in two more Mascot serials—The Miracle Rider, which gave him a scene as an antagonistic buffalo hunter in the first chapter’s historical “prologue” sequence, and The Fighting Marines, which gave him a more prominent role as Ivan, one of the henchmen of a masked criminal called the Tiger Shark. His exit from this serial, however, was somewhat embarrassing—after mouthing some rebellious sentiments, he was unbelievably strangled by his diminutive boss, who practically had to stand on tiptoe to reach Alexander’s neck. 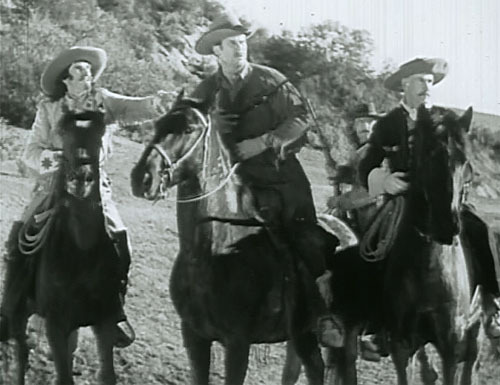 Above: Tex Cooper (far left) unsuccessfully tries to convince Richard Alexander not to poach the Ravenhead Indians’ buffalo in The Miracle Rider (Mascot, 1935). 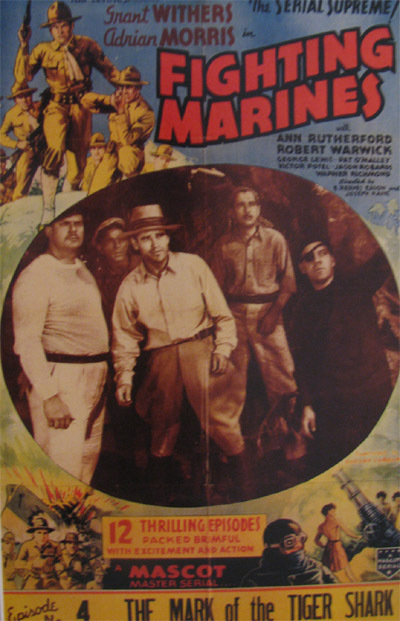 Above: Richard Alexander is on the far left in the photo insert on this poster for THE FIGHTING MARINES (Mascot, 1935). The other bad guys are, from left to right, Jim Corey, Warner Richmond, Donald Reed, and Max Wagner. In 1936, Alexander broke his string of small parts with a major—and rather offbeat—role in the Universal serial Flash Gordon, based on Alex Raymond’s famous comic strip. This outer-space adventure, the most successful serial ever made, cast Alexander as Prince Barin, the rightful ruler of the planet Mongo, who aided earthling Flash Gordon (Buster Crabbe) in his fight against the usurping Ming the Merciless (Charles Middleton). Alexander played Barin with both energy and dignity, making the character’s prowess as a warrior and his status as a prince equally believable. This against-type performance would prove Alexander’s best-remembered; the enduring popularity of Flash Gordon made serial icons of all its leading players. 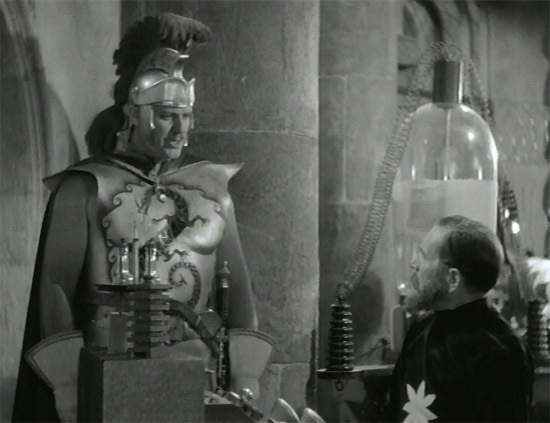 Above: Richard Alexander makes his first appearance in Flash Gordon (Universal, 1936), introducing himself to Frank Shannon (as Dr. Zarkov). Above: Richard Alexander confronts Priscilla Lawson (as Princess Aura) in Flash Gordon. Alexander followed up Flash Gordon with a part in the over-complicated mystery serial The Clutching Hand (Stage and Screen, 1936); he appeared in three chapters as an extremely tough sailor named Olaf, mate of a ship involved in the shady schemes of the title villain. Alexander’s role in Hand was small, but was both active and colorful; it allowed him the opportunity to matter-of-factly beat up an entire roomful of rebellious sailors, menacingly threaten to annihilate hero Jack Mulhall, and then come over to the side of good by helping Mulhall thrash a shipload of mutineers in a large-scale brawl. 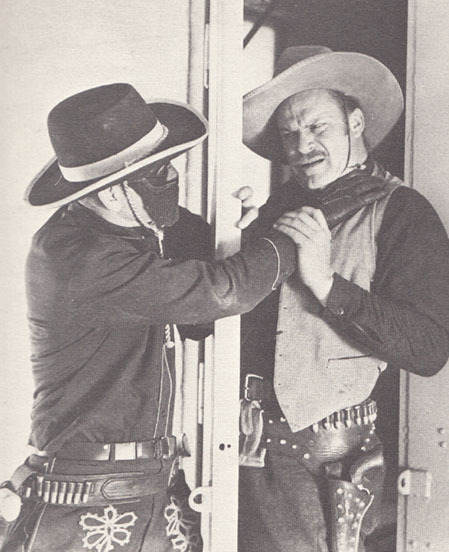 Above: A sheepish Richard Alexander is rebuked by Knute Erickson for rendering their entire crew hors de combat in The Clutching Hand (Stage and Screen, 1936). After playing the heroic Barin and the rough-hewn but ultimately likable Olaf, Alexander reverted to villainous form for two top-notch 1937 Republic serials. 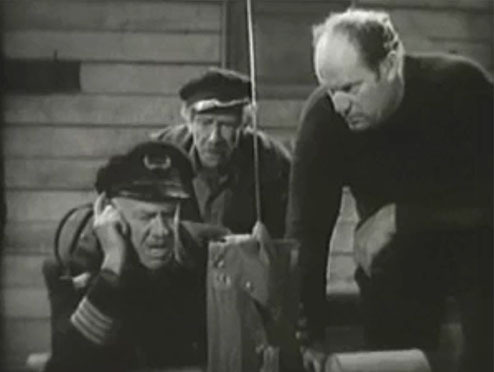 The first of these, SOS Coast Guard, gave Alexander a unique and very memorable role as Thorg, the mute semi-aquatic henchman of the spy and smuggler Boroff (Bela Lugosi). 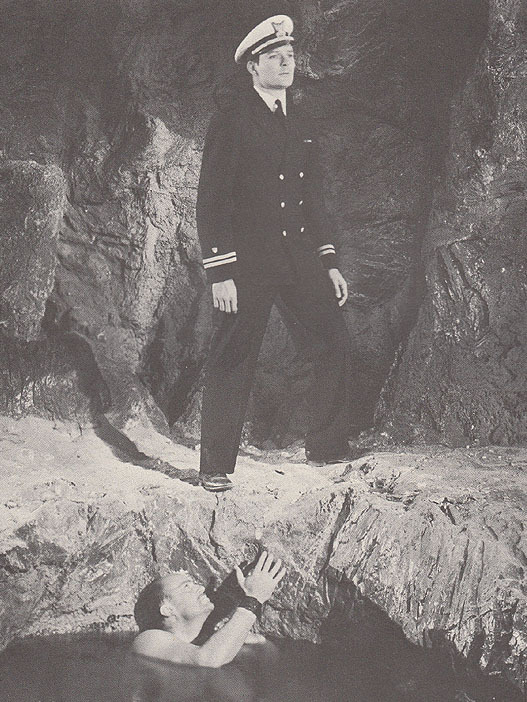 Alexander actually received more screen time than the better-known Lugosi in Coast Guard, serving as the villain’s most active agent and making numerous underwater attacks on star Ralph Byrd. Alexander also imparted some unexpected pathos to the role; his befuddled, dog-like reaction when berated and betrayed by Lugosi in the final chapter succeeded in making audiences feel temporarily sorry for the otherwise monstrous Thorg. 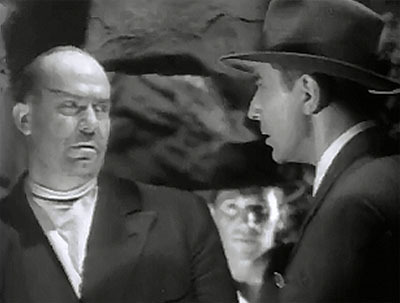 Above: Richard Alexander is nastily reprimanded by Bela Lugosi in SOS Coast Guard (Republic, 1937). 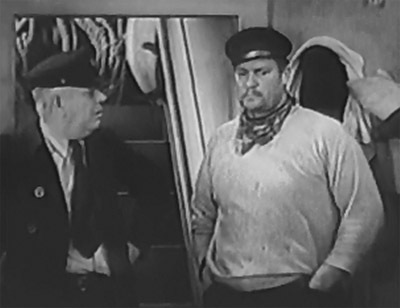 Above: Richard Alexander prepares to surprise Ralph Byrd in SOS Coast Guard. Zorro Rides Again, the second of Alexander’s two Republic chapterplays, again featured Alexander as a henchman to a more prestigious actor but again awarded him the lion’s share of the villainy. As Brad Dace (alias El Lobo), a leader of a gang of outlaws, Alexander made attempt after attempt to sabotage the California-Yucatan Railroad on behalf of rival railroader Marsden (Noah Beery Sr.). Marsden never left his big-city office, leaving El Lobo to exchange thrusts and counterthrusts with the California-Yucatan’s protector—James Vega, the grandson of the original Zorro. Alexander emerged as the de facto chief villain of Zorro Rides Again and played the role for all it was worth, sneering insolently when in possession of the upper hand and scowling furiously when thwarted by Zorro. Above: Richard Alexander makes a radio call to his boss in Zorro Rides Again (Republic, 1937). Jerry Frank is on the right. Above: Richard Alexander and his gang invade the good guys’ hacienda in Zorro Rides Again (Republic, 1937), but one of their number (on floor) has already run afoul of Zorro. Duncan Renaldo is facing Alexander in the center, while Al Taylor is standing behind Alexander. To the right of Renaldo are Nigel De Brulier, Helen Christian, and Reed Howes. 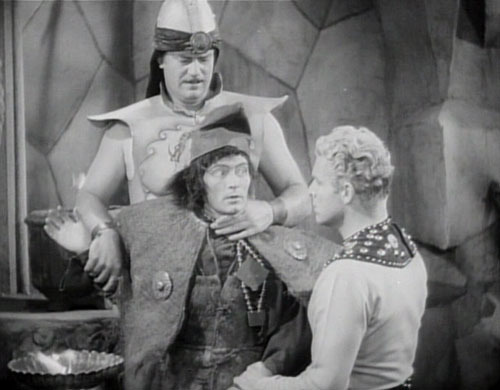 Alexander’s final major role was a reprise of his Prince Barin characterization in Flash Gordon’s Trip to Mars (Universal, 1938), an excellent follow-up to Flash Gordon. Barin made a surprise entrance in Chapter Six and again served as a valued ally to Flash throughout the rest of the serial; this time, the heroes were opposing an exiled but still megalomaniacal Ming on the planet Mars. Alexander handled the familiar role with aplomb, but the part would be his last major serial role—and one of the last major roles he would take in any production. Above: Richard Alexander holds a Tree Man while Buster Crabbe questions him in Flash Gordon’s Trip to Mars (Universal, 1938). Alexander’s final 1930s serial was the 1939 Columbia cliffhanger Flying G-Men, in which he played a small and uncredited role as a middleman heavy named Blaine, occasionally appearing to relay orders to lesser thugs and functioning as the lead villain’s lieutenant in the last two chapters after the principal action heavy was captured. 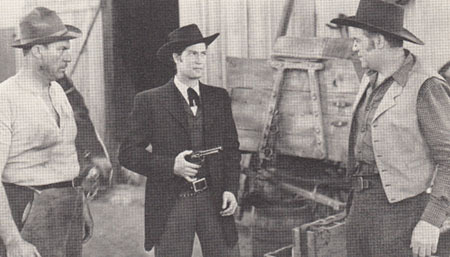 Alexander would spend most of the 1940s playing similarly small parts, only occasionally taking larger heavy roles in some of Universal’s Johnny Mack Brown and Rod Cameron B-westerns. 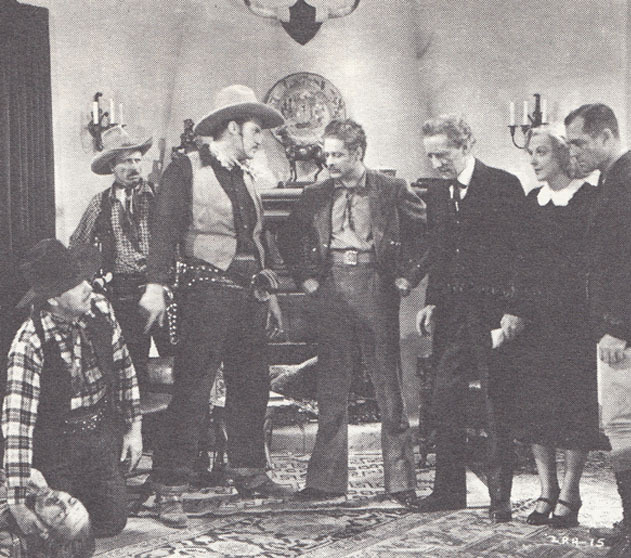 The 1941 Universal serial Riders of Death Valley also gave him a slightly more prominent part as an outlaw named Pete, who served as one of villain Charles Bickford’s background henchmen throughout the serial. He played a similar role in the Universal chapterplay Sea Raiders that same year, appearing as one of the seagoing henchmen (Jenkins by name) of spy Reed Hadley, and convincingly tossing around the serial’s protagonists, scrappy but diminutive “Dead End Kids” Billy Halop and Huntz Hall. Also in 1941, he made a memorable one-chapter appearance as an unnamed mute henchman (almost a parodic version of Thorg) in the comedic Columbia cliffhanger The Iron Claw; he menaced the heroine in a remote cabin and then engaged in a slapstick brawl with good guys Charles Quigley, Walter Sande, and James Morton. 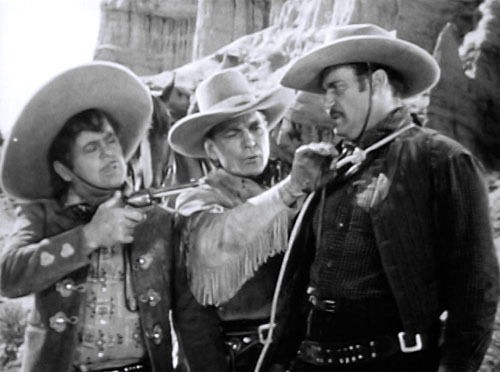 Above: Richard Alexander watches nervously as Buck Jones (center) and Leo Carrillo, seeking to bluff him into a confession, discuss using him as a trick-shooting target in Riders of Death Valley (Universal, 1941). 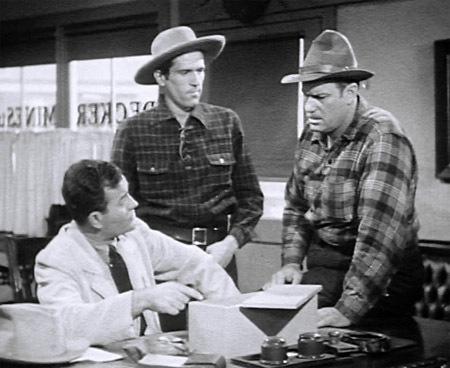 Above: Stanley Blystone delivers a radio report as Ernie Adams and Richard Alexander watch in Sea Raiders (Universal, 1941). 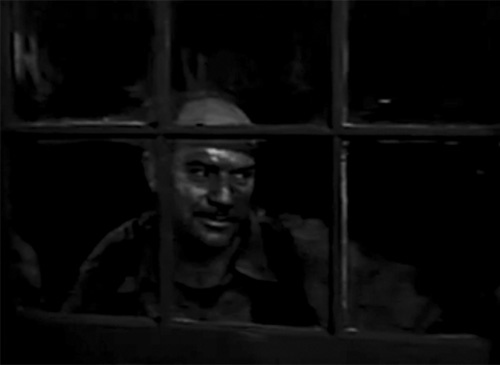 Above: Richard Alexander lurks menacingly in The Iron Claw (Columbia, 1941). Alexander continued playing small parts (as thugs and occasional good guys) in B and A films for the rest of his career, branching out into television in the 1950s. He made a few more returns to serials along the way, beginning with a pair of 1945 Universal serials, The Master Key and The Royal Mounted Rides Again. The first gave him a small part as a nightclub bouncer, while the second featured him slightly more prominently as shady prospector Blackie Laroc, who abetted the villains until they bumped him off as a security leak. In 1947, he popped up in the Republic serial Jesse James Rides Again as a helpful blacksmith named Clem, who gave hero Clayton Moore some information about an outlaw’s horse in Chapter One. 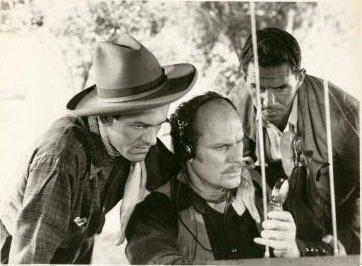 Above: Milburn Stone (seated), Joe Haworth, and Richard Alexander in The Royal Mounted Rides Again (Universal, 1945). Above: Richard Alexander watches as Clayton Moore gets the drop on Roy Barcroft in Jesse James Rides Again (Republic, 1947). Alexander reappeared at Republic in 1954, but only via stock footage; the serial Trader Tom of the China Seas utilized several scenes of Thorg’s malefactions from SOS Coast Guard, rechristening the character “Gorth” in the new footage. However, Alexander did appear in the flesh in Republic’s final serial, 1955’s King of the Carnival, in a non-speaking “red herring” role. As a circus roustabout, he wandered randomly in and out of the big tent and sometimes seemed to be eavesdropping on acrobat/T-man Harry Lauter, but ultimately turned out to be innocent of any connection with the counterfeiters Lauter was pursuing. Alexander worked steadily as a bit player and extra in movies and television until his retirement in the early 1970s. He got in touch with aficionados of his chapterplay work around the same time, visiting some serial and B-western conventions, receiving a “Golden Boot” award for his Western work, and taking visits from fans even after a stroke confined him to the Motion Picture Home in Los Angeles’ Woodland Hills. He passed away there in 1989. Richard Alexander probably never played more than forty credited roles over the course of his more than forty-year career, but any movie buff with even a nodding acquaintance with serials can identify him instantly, even in a walk-on—partly because of his enormous size, of course, but principally because of his unforgettable turns as the vicious El Lobo, the terrifying Thorg, and the heroic Prince Barin. Above: Richard Alexander tangles with Zorro (Yakima Canutt, doubling John Carroll) in Zorro Rides Again (Republic, 1937). Acknowledgements: For biographical information, I am indebted to the Old Corral’s page on Richard Alexander.